I recently acquired "Capablanca's Best Chess Endings". Over the coming week, I plan to share some of these games with you. The first game was a let down, because Corzo blundered away the Cuban Championship by playing 29...Nf5. After 30.Kxg4 and 31.Bxf5 or 31.Bxg4 White's playing an endgame that even I can evaluate as won (a passed pawn with pawns on both wings). 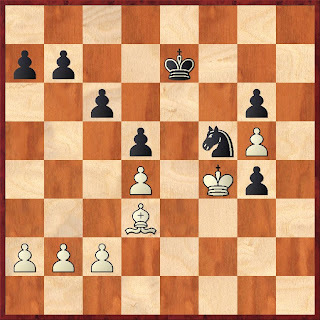 Then I played out the position against Rybka, and I didn't win! Perhaps this tells me something about Capablanca. He didn't show endgame genius in this game, but he did demonstrate superb technique we should seek to emulate. It also tells me I need to spend more time studying bishop vs knight endgames! Your page has become both a great resource for endgame material and for inspiration. Cause let's face it, we all know that an endgame book is usually as much fun and inspirational as a fearing hedgehog stuck up the "beep!". Thanks for keeping it fun and interesting for the rest of us.